is the longest of the five rivers that flow through the historic crossroad region of Punjab in northern India and Pakistan. It is located north of the Vindhya Range, south of the Hindu Kush segment of the Himalayas, and east of the Central Sulaiman Range in Pakistan. The Sutlej is sometimes known as the Red River. It is the easternmost tributary of the Indus River. Its source is from Lowangko Co, Tibet near Lake Rakshastal in Tibet, China, near Mount Kailas, and it flows generally west and southwest entering India through the Shipki La pass in Himachal Pradesh. In Pakistan, it waters the ancient and historical former Bahawalpur state. The region to its south and east is arid, and is known as Cholistan a part of Bahawalpur Division. The Sutlej is joined by the Beas River in Hari-Ke-Patan, Amritsar, Punjāb, India, and continues southwest into Pakistan to unite with the Chenab River, forming the Panjnad River near Bahawalpur. The Panjnad joins the Indus River at Mithankot. Indus then flows through a gorge near Sukkur, flows through the fertile plains region of Sindh, forming large delta region between border of Gujarat, India & Pakistan and finally terminates in the Arabian Sea near the port city of Karachi in Pakistan. 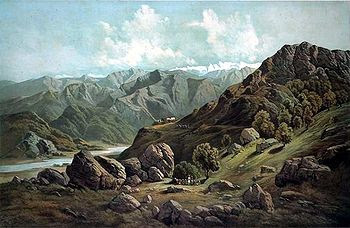 The Sutlej was known as Śutudri in the Vedic period.